Dark and beguiling, Nick Cave & The Bad Seeds unites a rare breed of musicians to create one of the world’s greatest living rock bands. With music varying from brooding ballads to blistering post punk, the enigmatic troupe reveal their mastery through their impeccable body of work. The latest of which is new record Skeleton Tree, a record that bristles with raw emotion. See Nick and co. when their Autumn tour takes them to Bournemouth, Manchester, Nottingham and London this September. Tickets are expected to sell fast upon release on Friday so set your personal reminder with Gigantic right now. Click HERE for your Nick Cave & The Bad Seeds tickets. Let’s Rock Shrewsbury has a well-earned reputation for being part of the ultimate retro festival by rounding up the best of the 80’s. The family friendly festival encourages everyone to dress up and celebrate the decade which brought us the new romantics, power shoulder pads and shell suits. This year sees them play the likes of Billy Ocean, ABC, Tony Hadley, Heaven 17 and many more. So, book today and look forward to a fantastic day of fun for everyone. Click HERE for your Let’s Rock Shrewsbury tickets. Electronic pop duo Pet Shop Boys fuse synth pop with a dry vocal delivery to create songs about the trials of modern life. Vocalist Neil Tennant and keyboardist Chris Lowe came to define the sound of the 80’s and pioneered the future of pop. They have gone one to sell more than 50 million records worldwide. Following the release of their new album Super, Pet Shop Boys will perform at Blackpool Empress Ballroom and Motorpoint Arena Nottingham in June to play their new material plus selected hits. Click HERE for your Pet Shop Boys tickets. Each year Dot To Dot brings together a mighty roster of alterative acts that never fails to thrill the many attendees. The festival spans across various venues for one day in Manchester, Bristol and Nottingham – three cities known for their vibrant music scene. 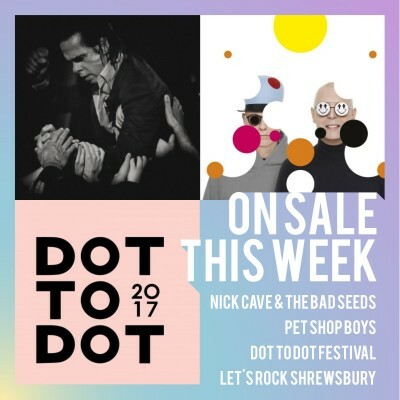 We are really excited to hear Dot To Dot 2017 showcases Sundara Karma, Amber Run, The Growlers and a whole load more big names! Coming on sale Friday morning, Cambridge based electronica pop band Clean Bandit release tickets for their headline performance at High Lodge in Thetford Forest. The Grammy Award winning dance act are the last name to be added to a string of concerts to be held at the idyllic location. See them play classic hits and new bangers. Fat Freddy's Drop add another date to their summer tour. The New Zealand draw influence from a range of influences including dub, jazz and reggae and put on a show guaranteed to make you get down and shake your booty. They now play Newcastle in addition to Manchester and London. Outlines 2017 is one of the first festivals of the year and certainly sets a very high benchmark. The two day Sheffield celebration links together the steel cities best independent venues to offer some big names. The genre defying event includes the likes of Jagwar Ma, The Selecter, Slow Club, The Crookes plus many more! Each year, the East London festival Field Day proves to be the very best place to sample the world’s greatest alternative acts. So, join the likes of experimental hip hop group Death Grips, shoegaze wonders Slowdive and the ultimate electronica producer Aphex Twin when they all play Victoria Park on Saturday 3rdof June, 2017. Click HERE for your Field Day tickets. Dare you take on The Beast@Betteshanger? The world’s biggest inflatable makes its way from Belgium for its first UK outing to take place at Betteshanger Park in Deal. The 893 foot demanding course has a 400 person capacity to test even the most intrepid bouncy castle explorer. Sheffield’s finest synthpop band The Human League will be taking over Lincoln Showground in May and Wolverhampton Racecourse later in the year during September. The play their smash hits to an enthralled audience.